Wasa 38 is the next model in the program. Yet a little bigger and more spacious than her younger sister. This model included an additional adjustment to IOR. An adaptation that went well because the model at its premiership in Kieler Woche came first place, a successful debut. The boat, despite adapting to IOR, has straight and unbroken lines, which generates little resistance in the stern. In other words, she has little water resistans and is lively to the character, a true typical Wasa boat. About 40 boats have been built. 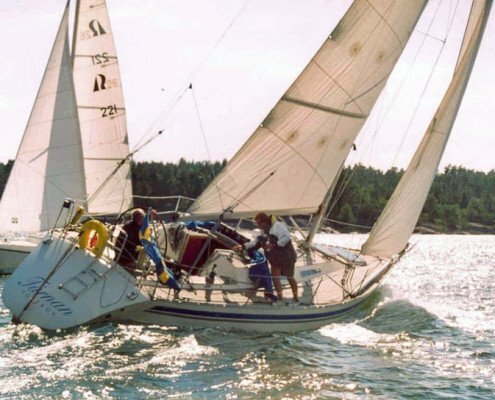 “With Wasa 38 we had to admit to making some changes.” IOR demanded it.” Hans Marklund and Leif Ängermark’s response to IOR became the Wasa 38, which immediately grabbed an overall victory in the prestigious Kieler Woche in June 1982. Compared to the Wasa tradition the new 38 was as far from its standard as one could come. Already with the Wasa 360, a big step away from the elongated Wasa-norm was taken, towards a wider and more compact ocean cruiser type. The more regulation adapted 38 went further on increased width, and she received the IOR boat’s characteristic concave stern. The famous ducktail effect, conditioned by a measuring rule that you could not neglect unpunished. 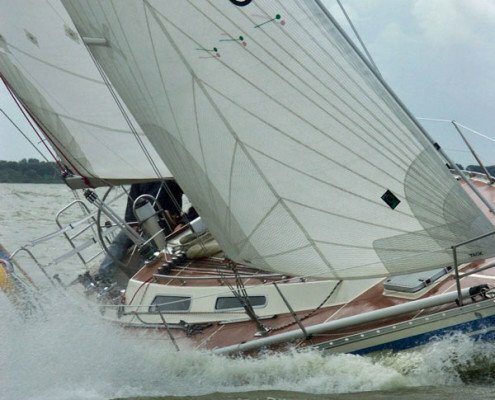 At the same time, Wasa 38 was intended to be used for regular family sailing, and almost all boats got a very comfortable interior. 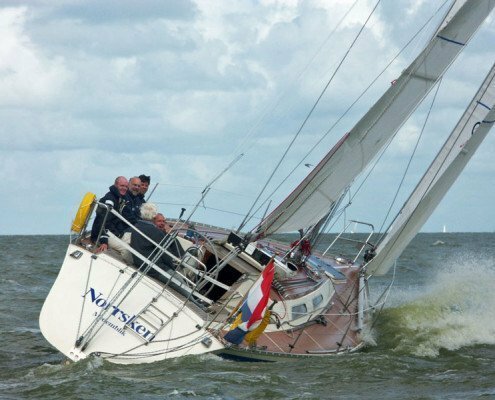 The Wasa 38’s best bow is – despite the ducktail – hard stern wind, where she outsail most other boats. At the same time, she is believed to be able to defend herself well, thanks to her good stiffness. It makes her a good all-round boat. Despite the IOR focus, Leif Ängermark and Hans Leander chose to make Wasa 38 “in its own way” – light. The boat’s displacement of approximately 5.3 tons places her in light / medium segments. It makes her lightweight and lively to her character. Wasa 38 is, by today’s measure, in the narrow spectrum of such a large sea cruiser. The lines are straight and unbroken to give little resistance and good water release from the stern. 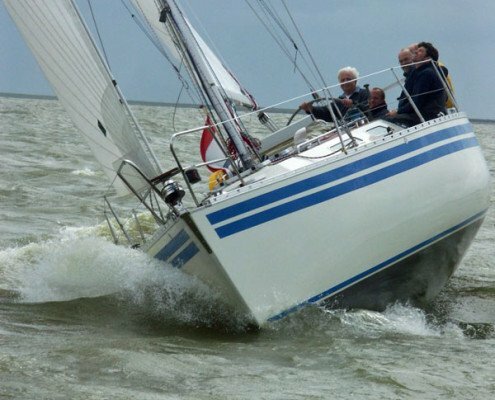 The keel in lead weighs 2.2 tonnes, which is about 42% of the boat’s weigh and contributes to a good rigidity. Rudder is completely free and quite large for good control and feel. Wasa 38 has a slightly emphasized spring line with a low overlay which gives a nice and timeless impression. The deck areas are big and comfortable to move on. The spacious cockpit is designed to fit both racing and cruising. Wasa 38 has a traditional ocean cruiser interior with the toilet in front of the main bulkhead, a very spacious kitchenette and a sturdy navigation table at the entrance, two quarter berths in the aft and a salon with pilot berths above the sofas. The starboard’s sofa is L-shaped, where you sit comfortable by the beautiful table.